GDPR COMES INTO EFFECT ON 25 MAY 2018. ALYNE IS OFFERING A FREE GDPR MATURITY ASSESSMENT. General Data Protection Regulation will come into effect in May 2018 to strengthen data security across the EU. The legislation will not only impact companies processing customers' personal data, but will also apply to companies exporting personal data outside the EU. Alyne is offering firms a free gap analysis to assess the maturity of their data protection processes and GDPR compliance management. 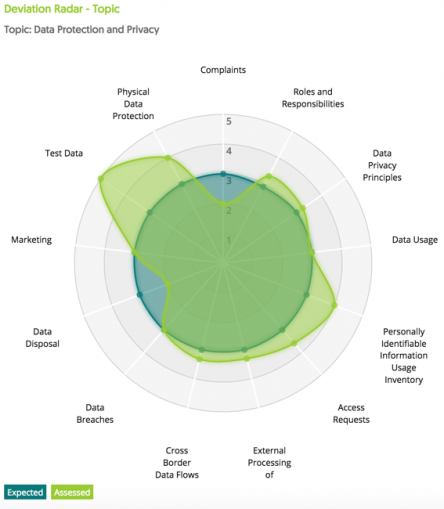 The gap analysis highlights expected maturity vs actual data protection compliance status. The Data Protection and Privacy option then allows the user to drill down to get a much more detailed view of maturity status. Read Alyne's White Paper about GDPR here!